This handout photo taken on June 12, 2018 and released by The Straits Times shows North Korean leader Kim Jogn-un (L) shaking hands with US President Donald Trump in Singapore. 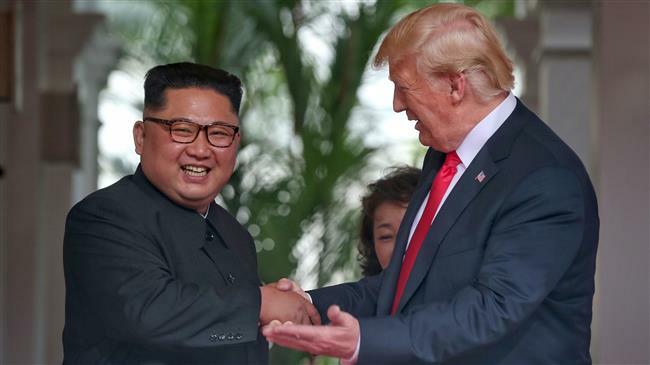 Washington(ANN)-President Donald Trump has declared North Korea an “unusual and extraordinary threat” to US national security as he acted to maintain harsh economic sanctions against Pyongyang, despite a historic summit with North Korean leader Kim Jong-un earlier this month. The official declaration came in a notice to Congress on Friday, in which Trump ordered that economic restrictions would continue for one year, The Washington Post reported. It also allows Washington to forbid North Korean leaders from selling or using any assets they may hold in the United States. It is separate from US sanctions related to the North’s human rights issues and international penalties imposed over its nuclear and ballistic missile programs. “The existence and risk of proliferation of weapons-usable fissile material on the Korean Peninsula and the actions and policies of the Government of North Korea continue to pose an unusual and extraordinary threat to the national security, foreign policy, and economy of the United States,” Trump wrote on Friday. The paperwork came a day after Trump said at a Cabinet meeting in the White House that North Korea had already started a process of “total denuclearization,” adding that Pyongyang had blown up four of its big test sites. However, US officials familiar with current intelligence on North Korea’s nuclear and missile test sites said there was no such evidence. Trump’s stern tone and list of accusations against North Korea marked a complete reversal from Trump’s optimistic language following his June 12 summit with Kim in Singapore. Following their meeting, the first between a sitting US president and a North Korean leader, Trump and Kim signed a joined document, committing to establishing new relations and achieving peace on the Korean Peninsula.